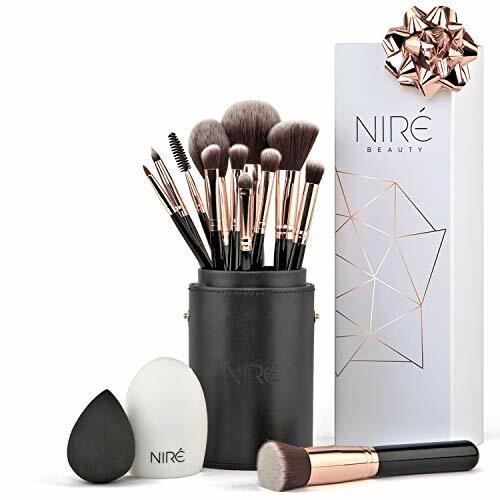 All Niré Beauty brushes are made with ergonomic wooden brush handles and lightweight ferrules in rose golden or silver. Ranging in size from handle to ferrule depending on their function, you have the freedom to use the entire handle for sweeping blending techniques or grip closer to the ferrule for more precise application. Why not travel with your favourite brushes? Every set arrives inside a gorgeous black brush holder that opens into two separate brush cups. Both functional and chic, this container keeps you organised when at home or on the go; like our brushes, it is vegan-friendly! This set comes with a BONUS Cleaning Tool. The key to glowing skin is to wash your brushes regularly, and using the PureForm brush cleaner makes the VITAL deep cleaning process quick, easy, and effective. Unnecessary break-outs can now be avoided as the PureForm ridges cleanse the bristles just enough to release stale makeup, dirt, and oils that would otherwise have gone back on your face. THE ORIGINAL & TOP CHOICE MAKE UP BRUSH SET: 12 thoughtfully chosen professional make-up brushes, a foundation blending sponge, brush cleaning tool, AND a pro brush holder that opens into two brush cups. CHOOSE THE PERFECT GIFT: Arrives Gift Boxed and ready to wrap! QUALITY GUARANTEE: Luxe England provides an exclusive 2 YEAR MANUFACTURER'S WARRANTY on all Niré Products. Our brushes are designed to last, 100% satisfaction guaranteed, no-hassle return policy from a British company. Order today with peace the peace of mind. STOP WASTING MAKEUP: Exclusive LuxePro Fibers are designed NOT to absorb extra liquids and creams. 100% Vegan-Friendly Brushes, Antibacterial, and Hypoallergenic providing better results than animal hair. KNOW YOUR BRUSHES: No more confusion about how to use your makeup brushes. The 5 Pro Face brushes + 7 Pro Eye Brushes are ALL individually named, with a Makeup Brush e-guide emailed after purchase. You will instantly know the BEST uses for your new brushes! GLOWING SKIN: The brush cleaning tool makes washing brushes quick, easy, and effective. Unnecessary break-outs from filthy brushes can now be avoided. Beautiful glowing skin can be yours.